Dropbox is the easiest way to store, sync and share your files online and between multiple computers. Any files or folders inside Dropbox will get synchronized to Dropbox's servers and any other computer linked to your account. Green checkmarks will appear on top of your files to let you know that they're synced and up to date. Your files are always safe. All data is transferred over SSL and encrypted with AES-256 before storage. Put your files into your Dropbox folder on one computer, and they'll automatically appear on any of your other computers that also have Dropbox installed (Windows, Mac, and Linux). 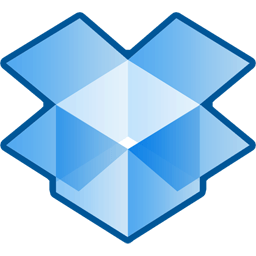 You can even download Dropbox apps for your smartphone or mobile device (iPhone, iPad, Android, and Blackberry). Everything in your Dropbox is available from the Dropbox website, too. Sync Windows, Mac, and Linux computers. Shared folders allow several people to collaborate on the same files. See other people's changes instantly. Use your "Public" folder to link directly to files. Control who has access to your shared folders. Kick people out and remove the shared files from their computers in the process. Automatically create shareable online photo galleries out of regular folders. Restore previous versions of your files. 30 days of undo history. Upgrades available for unlimited undo. Download notes: Alternatively you can download the latest Windows/Mac version of this software.